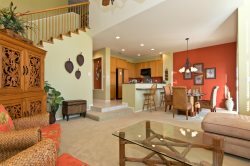 Plenty of room to entertain family and friends at this beautiful Waikoloa Beach Villa that features two bedrooms, two bathrooms and comfortably accommodates up to six guests. An inviting living room features modern furnishings and a large flat screen TV. The dining lanai presents a generous outdoor living and entertainment space and features an outdoor kitchen, built-in BBQ and a dining table with seats for four. The kitchen is integrated into the open-plan living and dining area and features high-end appliances, a breakfast bar with three barstools, and a dining table. The master suite offers a king-size bed, flat screen TV and a spacious bathroom with a deep-soaking bathtub, a separate walk-in shower and dual sinks. The guest bedroom offers two full size beds and is near the main bathroom. The living room has two ottomans that have fold out small twin size beds. Also included is a full-sized washer/dryer, air conditioning and ceiling fans, ice chest, boogie boards, beach chairs, , beach towels, and complementary parking and complimentary WIFI. All our vacation rentals include a basic “start-up” supply of: laundry detergent, garbage bags, kitchen sponge, liquid soap, dishwasher tabs, paper towels, toilet paper, shampoo/conditioner, small bar soap. Once the startup supply runs out, guests are on their own to purchase additional supplies if needed. Cleaning solvents are not supplied. Located across the street from the Queens' MarketPlace and next door to the Kings' Shops, complete with food court, art galleries, sushi, creamery ice cream, Macaroni Grill, Island Gourmet Market, Starbucks, and many other shops, daily local entertainment, classes and cultural events. Also within a 2-3minute drive is the famous Anaehoomalu Bay (A-Bay) beach with all the joys of white sand, trees, snorkeling, paddling, gorgeous sunsets, and more. Further down the road (10 to 15 minute drive) are other local beaches. - Flat Screen TV in living room. It was a great Condo perfect for our family. We very much enjoyed staying here. The Hilton pool pass was great and my kids loved that added bonus. Our 4th visit and just as convenient and enjoyable as the 1st. Perfect!